In addition to the classic paper-and-pen bidding option (Ballot Bidding), Helping Hand Group offers a state-of-the-art electronic silent auction platform that provides a great way to engage with your guests. Impress them with the ability to get involved in an easy and familiar way – on their own smart phone! Our Electronic Silent Auction (eSA) platform is backed by industry leader, GiveSmart, and boasts a wide range of benefits to boost participation in your silent auction. Our team will lend a helping hand before, during, and after your event to ensure that your fundraising event is as successful as possible for you. Our electronic silent auction system is a web-based platform that holds your event information, sponsor information, auction item list, and the ability for supporters to register and bid on items directly on the auction platform. 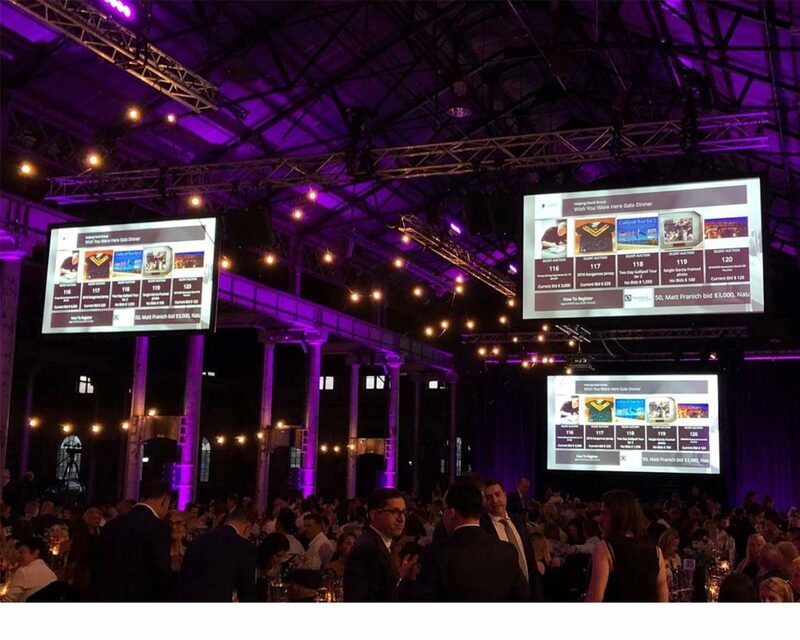 During your event, the auction dashboard is accessed via guests’ smartphones or tablets, and can be displayed on your event screens to integrate seamlessly with your fundraising event. 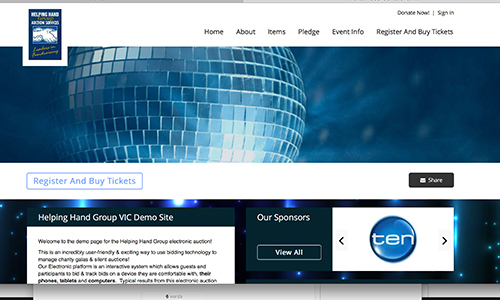 Our Electronic Silent Auction platform showcases your fundraising event, your auction item list, and any sponsors you wish to promote. Helping Hand Group’s experienced electronic silent auction team work with you prior to your event to ensure that your auction profile (the online dashboard for your silent auction) is set up with all your auction items – including donated items from sponsors as well as Helping Hand Group items. You can include as many auction items as you wish. There’s no limit! Helping Hand Group ensures that your auction profile is set up to represent your organisation’s brand and provide exposure for your sponsors. Because your auction profile is built in the electronic silent auction system beforehand, you can pre-promote auction registration to your guests via email or social media in order to free up their time at your event. Your auction platform can be shared online with whomever you desire. Reach a wider demographic by sharing a link around the world prior to your event and get more supporters bidding! The silent auction dashboard can integrate with your event’s audio-visual system to keep your auction exciting and top-of-mind. The silent auction can be accessed via your guests smart phones which allows them to register and bid on items. Further to this, Helping Hand group will be present during the event with tablets to assist with bidding and answer any questions with regards to the system or the items. Helping Hand Group’s expert team will be on hand to professionally set up all auction items, liaise with your fundraising event team, and ensure your guests know how to get involved with your electronic silent auction. The auction platform can display auction item photos, descriptions, and current bids and can be broadcasted on your event’s screens to keep the auction top of mind. The electronic silent auction system can be used to send quick communication updates directly to your guests’ smartphones via the silent auction platform. Registered guests can be notified when they have been outbid and informed of any other event updates such as upcoming speakers or reminders of the silent auction closing time. The silent auction display shows your guests the current bids on all items and can notify those who have been outbid. Guests who are unable to attend your fundraising event can still take part in your auction in real time. They can be kept informed during your event via SMS on auction closing times, when they have been outbid on items, and other auction updates. Avoid long lines of guests waiting to pay for items at the closure of the auction. Guests can process their own payments with ease from their smart phone through their personal bidding link via Secure Pay and simply collect their auction items on their way out. This prevents a bottleneck of guests trying to exit the venue. Helping Hand Group’s event team will ensure that all items are packaged up and given to auction winners or removed from the venue and shipped. Helping Hand Group will follow up with payments and invoicing and ensure that you have all auction reports for your event. Contact Helping Hand Group for a quick discussion on how the platform can benefit your next fundraising auction.